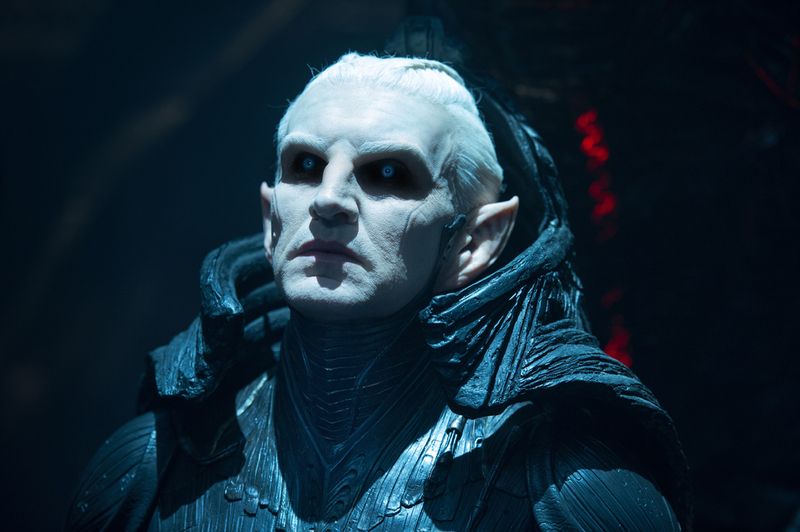 That’s a lot of characters for one movie and we haven’t even gotten to the bad guys yet: Malekith, king of The Dark Elves of Svartalfheim (Christopher Eccleston) and his right hand elf Algrim (Adewale Akinnuoye-Agbaje) who is transformed into Kurse, a terrifying creature of immense power capable of going toe-to-toe with Thor. But you know what? The screenplay is very well put together so that each and every one of these characters has something to do and each has their own part to advance the story. Even when a character is off screen for an extended period of time, there’s a logical explanation for where they are and what they’re doing and why we’re not seeing them. Each and every one of them also gets their own scene where they get a chance to shine. It’s a credit to the skill and generosity of the director, Alan Taylor that he manages that with slowing down the plot or making THOR: THE DARK WORLD feel cramped with unnecessary scenes. After the events of “The Avengers” Thor, The Warriors Three and Sif have been busy restoring peace and order to The Nine Realms. Loki is being held in the dungeons below Odin’s throne room. Odin is well pleased that his once arrogant and knuckle-headed son has grown up and is seriously contemplating turning over the throne of Asgard to him. Meanwhile, back on Earth, Jane Foster is in London pissed off because Thor hasn’t come back to Earth for her as he said he would. She’s been neglecting her research but Darcy Lewis pulls her back in by taking Jane to an abandoned warehouse where objects are appearing and disappearing into invisible pocket wormholes. Jane finds out where these objects go and that leads her to being infected by The Aether, a weapon of hideous power capable of destroying the universe. Malekith, his lieutenant Algrim and his army of Dark Elves are awakened by The Aether’s release and go in search of it, the intention being to…well, destroy the universe, what else? But by now, Heimdall has alerted Thor that there’s something wrong with Jane and so Thor brings her to Asgard to try and remove The Aether from her and that brings Malekith and his Dark Elves to attack Asgard itself and from then on its hammer time. 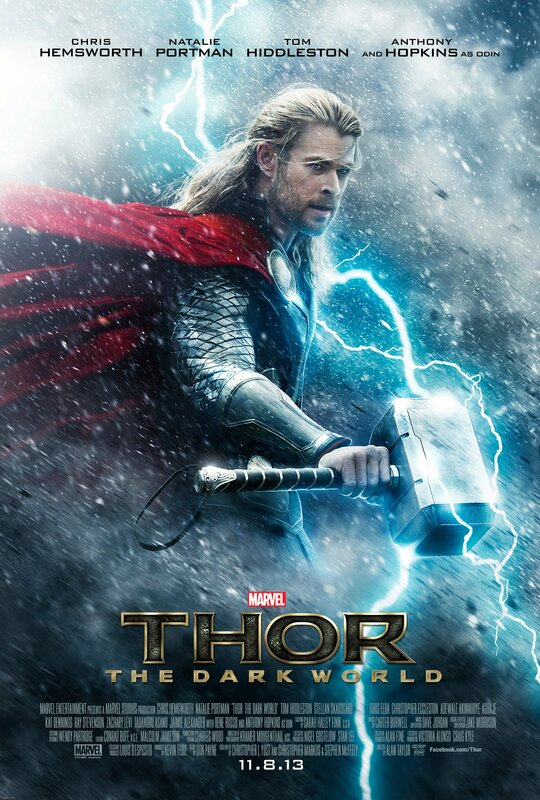 For those of you who complained that there wasn’t enough of Asgard in “Thor” this movie is for you. Most of the action takes place there with occasional side trips to Earth to check up on how the mortals are doing as they gradually come to realize that the Nine Realms are aligning themselves in a rare Convergence that will link the realms. 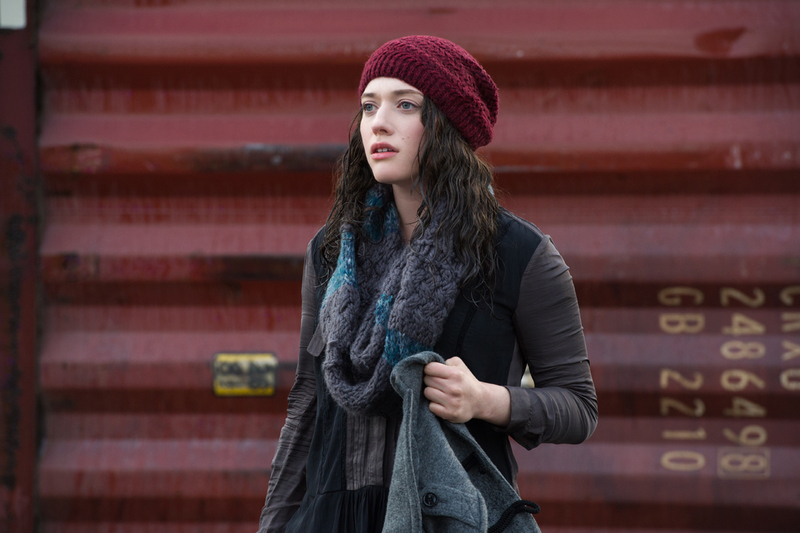 Keep your eyes on Kat Dennings during the Earth scenes as she provides most of the humor and does it with flair and a wicked delivery that strikes exactly the right tone for the situation her character is in. Chris Hemsworth gives us a Thor in this one who has learned how to care for others and put their needs ahead of his own and so he’s a much more heroic character here than he was in the first movie. Anthony Hopkins is his usual magnificent self as All-Father Odin while Rene Russo has a kickass fight scene that makes me wish Mrs. Odin had way more screen time. But it’s Tom Hiddleston who walks off with the acting honors in this one, of course. 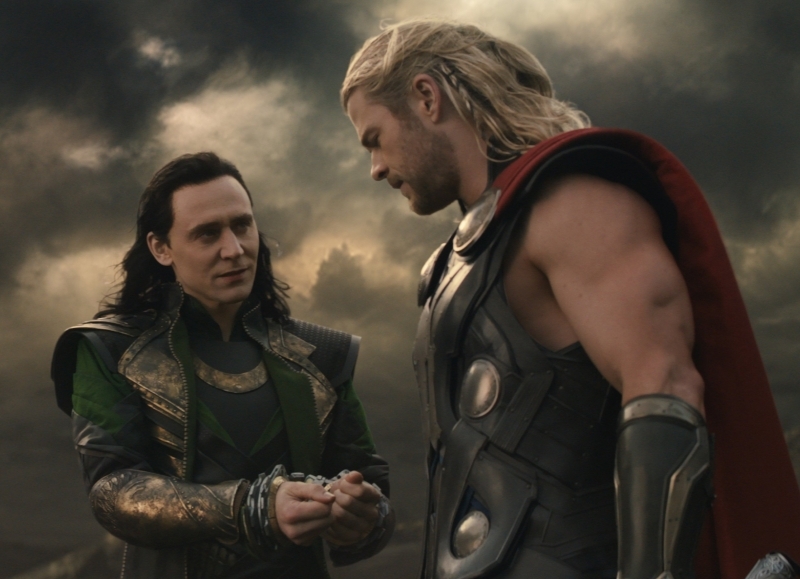 The relationship between Odin, Thor and Loki is a complicated one and the three actors get the most mileage out of it, giving it a near Shakespearean level of emotion. Hiddleston and Hemsworth especially shine during their scenes together when Thor and Loki have to team up to take on Malekith and they not only make quite the formidable team in battle but they honestly confront their feelings about each other and their relationship to their father. THOR: THE DARK WORLD is visually quite magnificent and if you know your Kirby and your Simonson you’ll be able to see their influences on Asgardian architecture, clothing, armor and weaponry. I liked the story a lot as it expanded and enriched Thor’s universe and as I said earlier, didn’t leave any of these characters out of the adventure. Even Mjolnir gets a nice bit of characterization as we see just how seriously the enchanted hammer takes its command that it must always return to Thor’s hand. There’s a lot of really great fight scenes and some tragedy that is truly gut wrenching but there’s also just enough humor so that we know to take it all seriously but not too serious that we can’t relax and have fun. I’d love to sit down Zack Snyder and his “Man of Steel” screenwriters to watch THOR: THE DARK WORLD because this is the way to make a superhero movie. 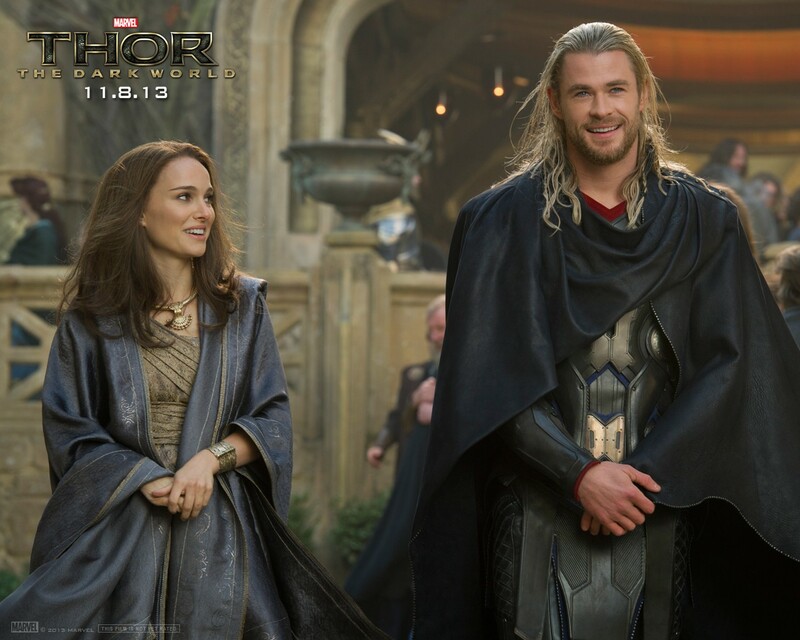 Stop reading this review and go see THOR: THE DARK WORLD right now. I did not like the first movie in the series, so was apprehensive about this one. Looks like I should give it a try. Indeed. I was so enamored with the movie that despite seeing it in 3D everything else in the outside world fell away. I was fully engaged and felt it was completely worth the pricey cost of the ticket! If they keep making them like this I’d like to believe that there will be new legions of fans for the comics as well.